My grandmother loved to tell the story about how I loved meatballs when I was a baby. She told me I would eat little pieces of meatballs while seated in my high chair. This much is certain: the meatballs were delicious, so why wouldn’t I devour them? My great-grandmother was an Italian immigrant who came to Brooklyn with traditions and recipes she passed down to her family, and I subsequently grew up with Sunday suppers that almost always included one dish made with a rich, red sauce. Mmmm, marinara. The Sunday morning smell of onions and garlic and olive oil in a pot on the stove? Anticipation. Add tomatoes and cook it slowly for hours? That’s home. 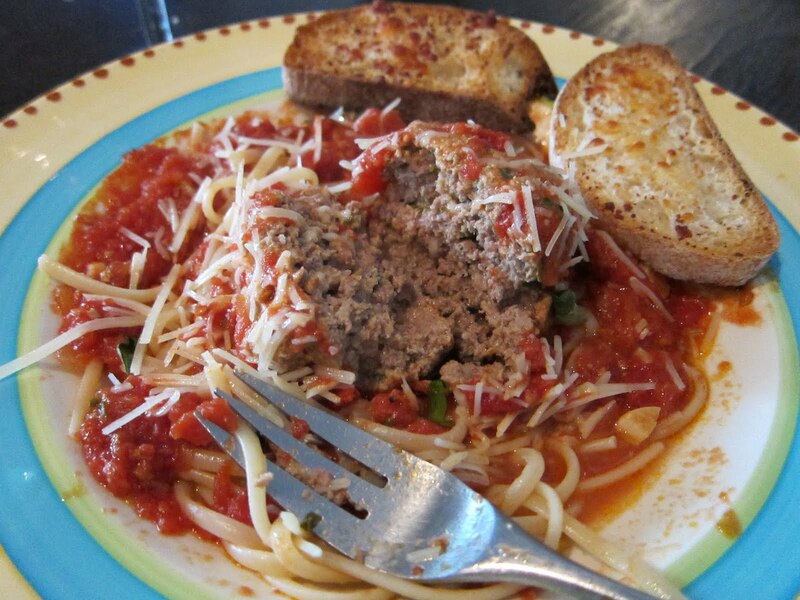 Spaghetti and meatballs were a staple for us. Sundays during autumn also meant that meals were planned around NFL football game times. This Sunday, I made meatballs for the evening game (go Giants!). I won’t print the entire recipe here because my meatball-making involves seeing and feeling the mixture (it feels like it needs more egg or it looks like it wants more breadcrumbs…). But these are my ingredients: ground beef, breadcrumbs, eggs, chopped garlic, chopped Italian basil, chopped Italian parsley, parmesan cheese, olive oil, and salt and pepper to taste. I mix it in a glass bowl with a wood spoon and make sure it’s combined but a little gooey, then gently form balls of the mixture—not packing, only loosely forming—and delicately drop the meatballs into the pot of simmering red sauce. As my Aunt Stef says, you want the meatballs to feel like they’re going to fall apart when you put them into the pot; this makes the meatballs tender, not tough. I let them cook in the sauce slowly, for an hour or so. Then it’s time to serve and devour them. The taste and smell brings me back!